Every year I have a look at the tools I use for organising my teaching and learning - the tools that support my personal learning environment and help me sustain myself as a life-long learner. Here is my PLE in 2008. There hasn't been much of a change in the number of tools - I have a core number of tools I use for most things. But they vary depending on the sort of project I am involved with at the time. In other words, some tools are dictated to me because of my work, as opposed to tools I choose for my own personal learning. For example, Second Life was significant last year because of my involvement in the Second Life Education New Zealand project. This year it does not feature at all - now that the SLENZ project is finished, I do not use SL. As you can see, my blog and ePortfolio wiki remain at the centre of my PLE. My ePortfolio is bigger this year because it was an integral part of my midwifery accreditation process earlier this year. As I have already mentioned, Second Life does not figure in my PLE. I will use it if particular projects crop up but I do not use it for personal learning on a regular basis. Google Reader, iGoogle and RSS has also disappeared because I get links and information from Twitter. This makes my reading a little more random and haphazard, but Twitter is a much better provider of information about synchronous events - it leads to many more serendipitous learning activities than Google Reader and the like. My blog continues to be my major place for reflection, development and process work. I found it difficult to blog regularly last year because of the intensive eMentoring project I was involved with. 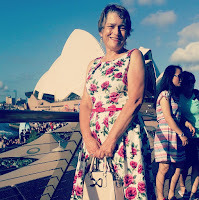 But this year I have made a point of blogging at least three times a week as a renewed attempt to connect with readers. Slideshare and YouTube continue to be the main places I deposit my material and the first places I go to when I am searching for information, especially for course development. I have also used Blip.TV at lot this year, mainly for storing audio recordings of the Virtual International Day of the Midwife (VIDM). I have also increased my use of Animoto and Screenr to make videos and screencasts for class materials. I have increased my use of Delicious as a way of collecting materials for course development and sharing with students. My connection with Elluminate has also grown, not only because of my teaching but also because of the significant number of free professional development sessions that are offered every week by people such as Steve Hargadon and Carole McCulloch. And of course, it played a huge part in the success of the VIDM. Facebook continues to grow in importance, not just for connecting with people but also for sharing information. I know I have said it before, but I cannot ignore Facebook because so many midwives use it. It played a significant role in advertising the VIDM and disseminating the recordings of the sessions. It is slowly but surely starting to turn into an ePortfolio platform for me. I post links about what I am doing there, and I get tagged by other people connecting to the same events as I do. I firmly believe Facebook can be used as a professional ePortfolio with a feedback mechanism built in that is far more user-friendly than the wiki I am currently using. This is definitely an idea I am going to play with more over the next few months. Finally, the other platform that is grown in relevance this year is Wikieducator. This is mostly because I have developed the open, online course 'Facilitating Online' in Wikieducator. I have become a lot more confident with it's use and feel very comfortable there as opposed to a year ago. What I am finding is that I learn little tips and tricks as I go along. It is quite a time-consuming process but it has been effective because I have learned as the need as arisen. I'll leave you with the same questions I asked last year. How is your PLE looking these days? How has it changed in the last year? What are your favourite tools now, and why? These sorts of reflections are such a great idea. I find there a really useful way to identify patterns that aren't immediately recognised in day-to-day interaction. I would suspect that my PLE has shrunk dramatically over the years - largely due to time constraints and increased responsibilities. That said my blog and Twitter remain at the centre; as would email, and Google for locating information. There's likely to be other components I use less frequently like YouTube, Google Docs, and perhaps SlideShare - but really these days that's more or less the extent of it. When I started using social networking in 2007 I had a million accounts and tried every tool that came out. I felt guilty if I wasn't using 101 different things at the same time. But now, similar to you, I have cut back to a basic core of tools. I probably wouldn't even use half of them if it wasn't for my particular line of work. 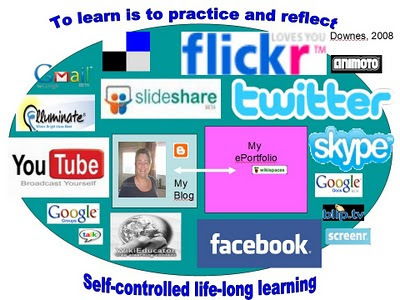 If you told me I could use only one tool for my personal learning it would be 'head or tails' between my blog and Twitter. If you're allowed only one thing, what would it be? - I've added Diigo to my list of tools lately. I was reluctant to jump on board when everyone first started going crazy for it. A few months ago my co-workers talked me into joining. I never figured out the social aspect of Delicious, but with Diigo it is very easy to get a handle on. And now a question: what did you use to create a visual of your PLE? @Sarah - Yeah I'm constantly running across accounts I forgot I created. I think there's a lot of value in experimentation, however I'm still very selective about what I integrate into my core tool-suite. Really this can take a variety of forms when you factor in textual, visual/video and auditory, and/or synchronous or asynchronous; but even so my list is still relatively small. @Claire - I'm finding I use Twitter and Google Reader fairly equally to locate new/useful sources of information or articles. The centralised nature of Google Reader is its main value to me - along with the integration with more discursive spaces like Buzz. However I like Twitter because it incorporates a sort of crowd sourcing and peer evaluation of materials. Anything that's recommended by someone I follow almost immediately carries more weight than it would have had I run across it in a search query. I'm with you on Diigo. I didn't like it at first; in fact I hammered it as a matter of fact - but over time I grew to really appreciate the social/discursive aspects of it and the fact you can create groups. That said I still don't use them much, and don't use social bookmarking in general as much as I do other things - but the public/social layer does provide a really valuable element when I need it. @Claire I never thought I'd give up Google Reader but...there you are...I have never even looked at Diigo...will have to do that next. I created my image using PowerPoint & then turning it into a jpg file. @Mike So I wonder how long it takes to settle into a 'routine' of tools and ways of working online ...to establish a PLE? Interesting to note that you don't use SL any more. I found it got in the way of easy communication - but think that a study of the psychology of SL - e.g. why folk choose the avatars they adopt - would be fascinating! @Michael I am still hopeful that a SL project with midwives will materialise. I do not feel we have properly evaluated the virtual birth unit in relation to learning outcomes. 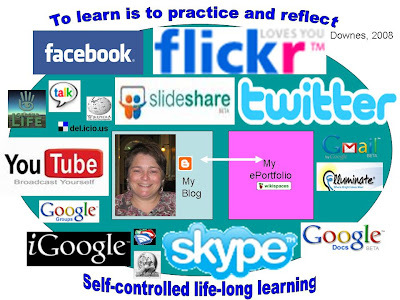 @Sarah, thanks for the info on how your created your PLE images. @Mike I agree that the crowd sourcing and peer review aspect of Twitter make it a valuable place for finding new sources--especially when lots of people in your network are tweeting about the same source! I'm a vocational teacher trainer from Finland and got a hint of your online facilitation course from a colleague of mine, Heli Nurmi. It really looks interesting and I'm going to be lurking the course. Won't participate though, since this coming year I'm on a study leave and will have other projects. Like you, I first got interested in "everything" and made a billion accounts + got bad consciousness for not using everything effectively. My courses aren't purely online, we also have 19 contact days/year + I observe my student teachers' teaching practice at their schools. We use Moodle as a core and to it I integrate other services. For each new course I put up a gmail account, and register everything else with it. I embed google calendar into our Moodle platform. All students use that calendar to inform about their teaching practice sessions (they observe each other's teaching too). With Google Maps integration it's easy to find directions to respective schools. Students can use Moodle wiki (which I find clumsy) or e.g. Google sites, Google Docs or a blog for their team reflections. The students who are just learning to write together online often prefer Moodle wiki, since they feel that there is too much to grasp if they have to spread out a lot. I feel that it is very important the students get a feeling that I'm present in their online activities. I use Google Reader to follow their updates, so that I can give them comments while the matter is fresh. I spend a lot of time in the net, so giving a quick comment isn't much of a burden. Or so I used to think, although lately I have noticed the same kind of time management problem you describe in one of your posts! It's so easy to get emerged into blogs etc. and forget, how much time it takes. I use pretty much the same tools you do. Instead of Flickr I upload pictures to Picasa, though (since the account comes with the gmail I make for the course). Another difference is that I don't use Facebook. I made that decision about three years ago, and have stuck to it. My reason for this wasn't the creepy treehouse discussion that was going on at that time, but the fact that I seem to get addicted to netlife and felt that with FB that could mean that I won't have any real life left! I also find Delicious and Slideshare a must. But what I really want to use more, are different audio and video services, official online learning is still too much text text text! My school has Adobe Connect Pro, which I use but don't like. It is too heavy, and we experience too much technical problems with it. For person to person counseling I therefore prefer Skype. I've also experimented with Tokbox, since all my students don't have admin rights to their work computers and can't install Skype. For videos I use both YouTube and Vimeo. The latter is handy in cases where the video is longer than 10 minutes, but still below 100 MB. For years I have tried to find a good audio tool. Services have come and gone. Now I'm trying to get a grasp of Audioboo. Looks promising. I can publish the audios directly from my iPhone. The limitation is that each boo can be max 5 minutes. Sometimes it's necessary to be able to share big files with students. E.g. I record the teaching practice sessions and feedback sessions, and want to send the audios to respective students, not the open internet. I used to do this by uploading them to Moodle, but our it-services told that this makes backuping too slow. So, I have to find a new solution. Dropbox seems like a good one, though I have only limited experience yet. (if you aren't familiar with dropbox, here is a link). Huh, this is becoming quite long! Got to quit, but I still want to mention one service I use a lot. As a Mac user I'm privileged to have Skitch, an exellent tool for taking and sharing screenshots. Good luck with your course! Will be back later! Irmeli Pietilä aka "Sun äitis"
thanks for the hint! As I mentioned earlier, it's always good to have alternatives that don't require installation. I just had a quick look, but noticed that there is only a 30 day free trial. With some of my African students even small fees can prove to be too much, but I'll have a closer look later! @Frank Thanks for the tip. I haven't used any file share services yet but I have heard very good things about DropBox. 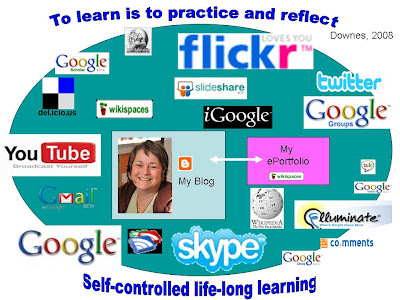 @Irmeli Thank you so much for sharing such a thoughtful list of tools you use, and why you use them - it is always really useful to compare practice. I was thinking I needed to integrate Google Calender into the 'Facilitating Online' blog so that people can keep an eye out for the live meetings - now you have given me the impetus to do that. I tried using FB with students last year but they didn't take to it. But I have found it to be extremely effective for accessing the general midwifery population for my work I do in PD. I was also interested in your Adobe Connect comment because our institution is thinking of ditching Elluminate in favour of Adobe Connect. I have to say I have a soft spot for Elluminate and am very reluctant to try other things. For screen shots I use Jing - I love the fact you can add comments, arrows etc to the image. Now I am now using Microsoft Office, I need a good tool that will compress my photos and crop them - any suggestions?